The You want handsome? You want class? You want a gentleman among gentlemen? All hail Gregory Peck, 87 on April 5, 2003, among the best-loved of all Hollywood actors, by his colleagues and by the public, and star of the wonderful (and wise) romantic comedy, Roman Holiday (1953), available in a newly restored 35mm print, in celebration of the film's 50th birthday. I talked to Harlan County USA filmmaker Barbara Kopple, who, urged on by the actor's daughter, Cecilia, made a documentary about Peck several years ago, mixing interviews with scenes of his charming one-man stage show. Kopple found no secret Peck: he was as kind and humane in person as he seems on screen. "For me, he is the Atticus Finch character in To Kill a Mockingbird," Kopple said. "It's a film about ethics and social justice, which shows him to be a wonderful father. Peck speaks out on the gun control issue. He does it with finesse and dignity, and people listen." Was there anything on the cutting-room floor of Peck losing his temper? "No, never!" said Kopple. "He's a very private person, but he liked our crew, and trusted us. The only thing he felt uncomfortable about was that he can't walk so well anymore. He's a tall man, and he was touchy about us filming him walking and trying to get somewhere." Half a century ago, Peck was, at 37, an agile match in Roman Holiday for elegant Audrey Hepburn,23; and he was so courtly that he, a huge Hollywood name, allowed filmmaker William Wyler to give Hepburn the moving, expressive closeups, which led to an Academy Award in her first major role. In the year of Queen Elizabeth II's coronation, Hepburn plays Princess Ann, heir to the throne of an unspecified European country, who, faced with endless formal meetings and parties with fossilized nobility, can't take it anymore. Nearing a nervous breakdown, she races away from a Roman palace and, without revealing her royal identity, hooks up with a normal American guy, Joe Bradley (Peck), whom she meets on the street. She doesn't know that he's a journalist. When he figures out who she really is, he promises his editor an inside scoop story, all the time they're falling in love. Will he sell her out to his tabloid-minded newspaper? Roman Holiday, though transposed to Italy, owes its setup to the 1934 screwball classic, It Happened One Night. In each case, a runaway rich girl meets up with a pragmatic, seemingly amoral newspaperman. Romance ensues. She finds fun among the common people, and he discovers he's got a heart and scruples. It Happened One Night is the funnier of the two movies, and with a satisfying if predictable comedy conclusion. Roman Holiday is enjoyably inconsequential throughout; but just when you ready yourself for a heart-warming commoner-gets-princess ending, perfectly reasonable considering the appealing leads, there's a jolt. The last ten minutes of Roman Holiday are really something special, as Hepburn's Princess Ann has returned to the throne, as Peck's regular Joe waits for her to abandon it all, leap into his adoring arms. 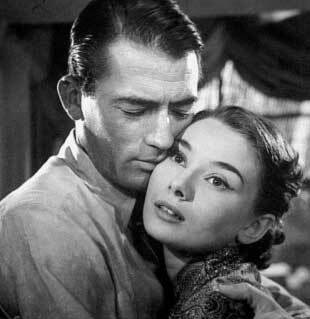 Though the movie is fifty years old, Roman Holiday's astonishing ending won't be given away by me..